Comfort is king (according to my wife), and this sleeping pad delivers! For three-season camping, it works great and allows us to sleep together (unless she zips up her sleeping bag and shuts me out, that is). 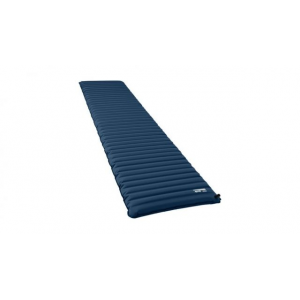 With the two independent chambers and nearly 3.5 inches of comfort, the NeoAir Camper Duo is among the more comfortable sleeping pads (single or double pads) I've slept on. In fact, even now when car-camping, my wife and I prefer this pad over our super-duper-deluxe queen-sized inflatable bed—not just for the convenience, but for the comfort as well. When one person rolls or shifts, the other person hardly notices, and there is virtually no rolling into the middle. This is much different (i.e. better) than a single chamber air mattress. Independent air chambers really help in minimizing disturbances caused by partner movement. I'd much prefer a better way to inflate this pad than the mechanical pump that it requires. A few better options would be an integrated speed valve that Therm-a-Rest has included in so many of their other product lines, an integrated foot pump, an included pump sack, or self-inflating options. Simply blowing into the valve and filling with my breathe is not an option for two reasons; 1) combined, the two chambers are way too big and I get light-headed way too quickly, and 2) using air from the lungs just isn't a great idea due to the potential for mold build-up inside the pad. I've been able to use an older rechargeable pump that I have from a previous pad, as well as an electric pump. However, not everyone is going to have these, so I think Therm-a-Rest could potentially add a solution for this product. A couple options could be, a pump sack with valve attachment, or one of their existing pumps (i.e. NeoAir or Torrent). Air valve, with one on each side. At first glance, I thought the r-value on this pad was too low (2.2 r-value makes it just barely a 3-season pad according to Therm-a-Rest's definition). However, the more I used it and the more I thought about when my wife and I are most likely use a double-pad, the more it made sense to me. My wife is an extremely cold sleeper and very rarely agrees to sleep outside if the nighttime temp dips below 50°F (10°C). I suspect we aren't an anomaly here and many couples have a cold sleeper and a warm sleeper, so an average r-value makes sense. The pad is more than adequate in the summer months when nighttime temps barely require a sleeping bag, but during the shoulder seasons when nighttime temps are more unpredictable, the pad may require a little bit extra insulation or protection. During the cooler nights that my wife and I slept on the pad (i.e. 45°F / 7.2°C) we simply added an extra layer underneath and were completely fine (note: no matter the weather, she sleeps in a Therm-a-Rest Adara rated at 22°F). As long as the bottom layer is thin, it can be used on one side or both, although both is preferred for a slightly more level pad. 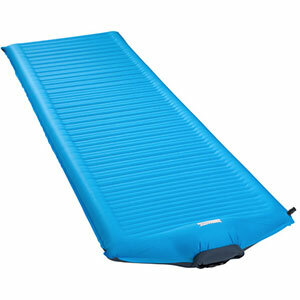 Like most sleeping pads, this does have a distinct noise, but it's not too bad. Neither my wife nor I have lost sleep because of it. While it's hard to describe the noise, I'd say it is somewhere between crumpling paper and a stream tumbling over rocks. Either way, it's not the most silent pad, but it isn't particularly bothersome either. Often overlooked until it's too late, a pad's stability (or slipperiness) is a crucial aspect to me. Too many pads are made with slick materials that are difficult to stay on at night when tossing and turning. I have not encountered any such issues with this pad, and I move quite a bit in my sleep (or at least that is what my wife tells me). The horizontal baffles likely help with stability too, or at least that's what my experiences have taught me. Logistically, one pad has been easier for us than two...easier to carry, easier to inflate (i.e. same valve), easier to store. Having a shared pad has offered us a sliver of the comforts of home while in the backcountry. Body heat is more easily shared on the pad (although some may argue this is a disadvantage, my wife vehemently believes it is an advantage). We bumped into each other more than when sleeping on individual pads. My wife and I both agree that the NeoAir Camper Duo is the best shared sleep system we've tried. Car-Camping or Backcountry, or both? It depends. At 4 lbs 5oz., it certainly is not a lightweight sleeping pad. In fact, that is pretty heavy! 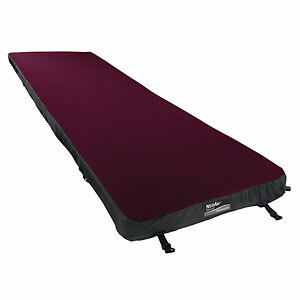 However, remember that it is two sleeping pads, not one, so 4lbs 5oz divided by 2 equals 2lbs 2.5 oz. each. Now that isn't ultralight for a pad by any means, but certainly a respectable weight. For comparison, my standard single pad is 2 lbs, although it is insulated and has a better r-value. 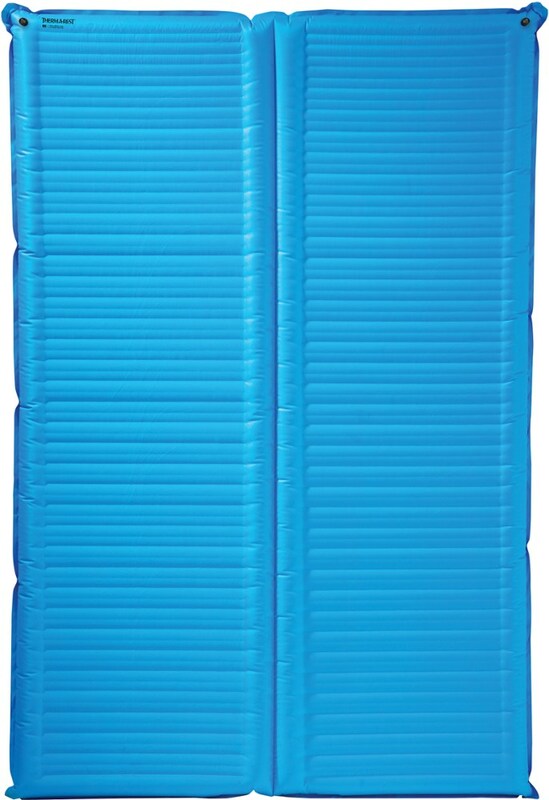 While some may see this as only a car-camping pad, I am comfortable carrying it on shorter 1-2 night backpacking trips, but would likely pack something lighter for longer trips. Packed size comparison, next to a basketball and rugby ball. While I do believe comfort and convenience should cost something, I think Therm-a-Rest has this priced a little high ($300 ) when their comparable single pad—NeoAir Camper SV (speed valve)—is around $130 and they have several other single pads with as good or better R-value in the $100-$150 range and most of which are much easier to inflate/deflate. I'd expect it to be a little closer to the average cost of two pads (maybe $225-$260), especially since it does not have speed valve capabilities and has a relatively low R-value rating. 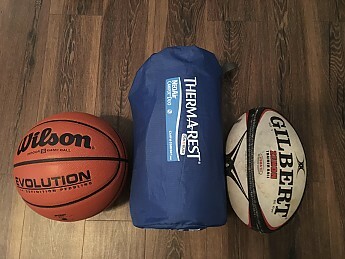 Overall, my wife and I both believe the Therm-a-Rest NeoAir Camper Duo pad is a vast improvement over other shared sleeping methods we've tried, including our double hammock (better in comfort and maneuverability) and a car-camping queen inflatable mattress (better in packability and space-saving). I think the one area of improvement could be a better inflation/deflation method that does not require a mechanical pump, but aside from that, this is a big, comfortable pad for partner sleeping in three-season weather. With persistent rain, we were stuck in the tent with a lantern and a deck of card, so the pad became the playing surface. I tested the Therm-a-Rest NeoAir Camper Duo during the summer and fall months throughout the valleys and ridges of the Appalachian Mountains, spread across central Pennsylvania. Overnight temperatures ranged from 80°F to 45°F (26.7°C to 7.2°C). 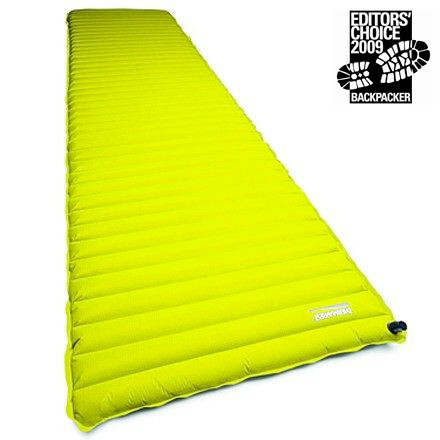 I tested it alongside my wife, whose opinion on the sleeping pad is noted throughout this review. Great review, Kiwi! Thanks to you and your wife. You've given me something to think about with the duo pad option.